The Walking Dexit Continues for TWD (Even the Stock Price is Dropping), Is the End in Site for the Show? 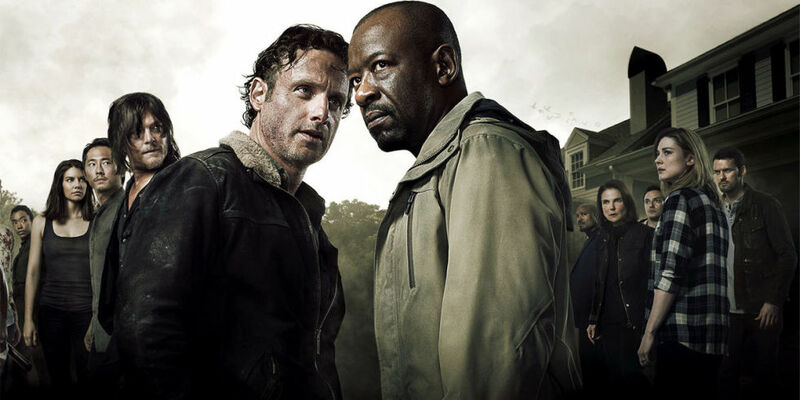 Another season for The Walking Dead has started and yet again the numbers for what was once the highest-rated scripted show on all of television (by a significant margin) have taken a notable hit as the audience continues to exit the show. The Season 9 premiere drew a 2.5 rating based on same day viewing for the 18-49 demographic with 6.1 million total viewers which are the lowest numbers it has seen for a debut performance. Then this past Sunday the show slipped to a 2.0 score which marks a series low for ratings. I expect those numbers will slip even further in the coming weeks and could start to approach the 1.0 level by season end. But it still remains the top-rated scripted show on the cable channels and among the top across all of television, so I don’t see it as being in any danger this year. However, I do believe that the timeline has shifted for the show and it could be heading to an end sooner that previously expected. When Will the Walking Dexit Take Its Toll? I have been covering what I refer to as the “Walking Dexit” since the show’s numbers went south during its seventh season and have thus far had very little concern over the show getting cancelled. Even though it was seeing a steady decline, it was still head and shoulders above every other scripted show on television. The numbers had already slipped some in the show’s sixth season as its 6.5 ratings average was down by 11% from its fifth year when it peaked at a 7.3 average. 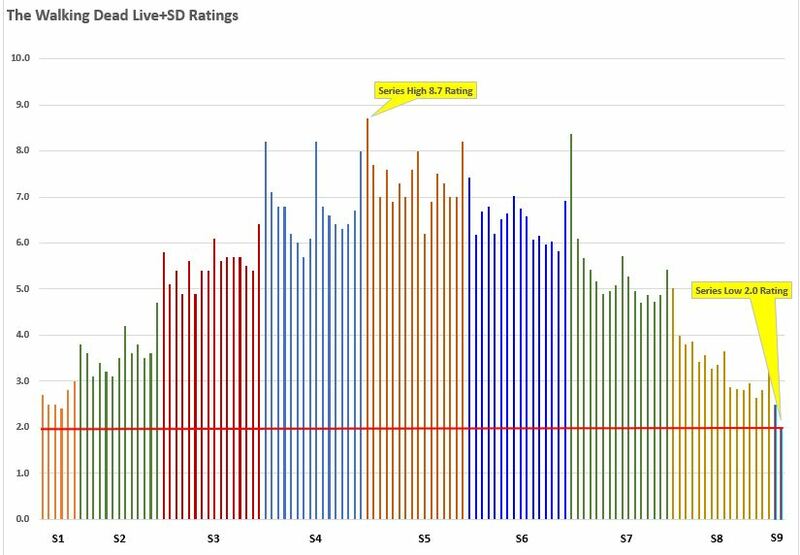 In TWD‘s seventh season, its average slipped to a 5.4 rating, and last year it slipped further to a 3.4 average. That’s a drop of over half across three seasons, but the show remained in the Top 5 among scripted shows on television. And it is still in the Top 10 so far this season. But something happened just recently that I believe will have a significant impact on the show’s future. After posting a series-low for season premiere numbers, Wall Street got nervous and AMC’s stock dropped. I have been covering ratings results for over ten years now and that is the first time I remember them impacting stock prices for a network. And if anything gets the attention of network executives, it is a drop in the company’s stock. They have since rebounded, but I believe the damage is done and this could lead to panic among the execs and tinkering with the show that could hasten the audience departure. Network execs are notoriously out of touch with what their audience wants, and interference on there part is almost always a bad thing for a show. When Will the Show End? AMC CEO Josh Sapan has suggested that the franchise could stick around for another decade or more, but that timeline is seeming less likely considering the ever-hastening ratings attrition that TWD and its spin-off Fear the Walking Dead have been experiencing. I previously estimated that the main show would go for at least twelve seasons, but I am revising that down now. I would say with 99% certainty that TWD will not get cancelled this season. There’s no reason for that, even if the ratings fall below the 1.0 level. 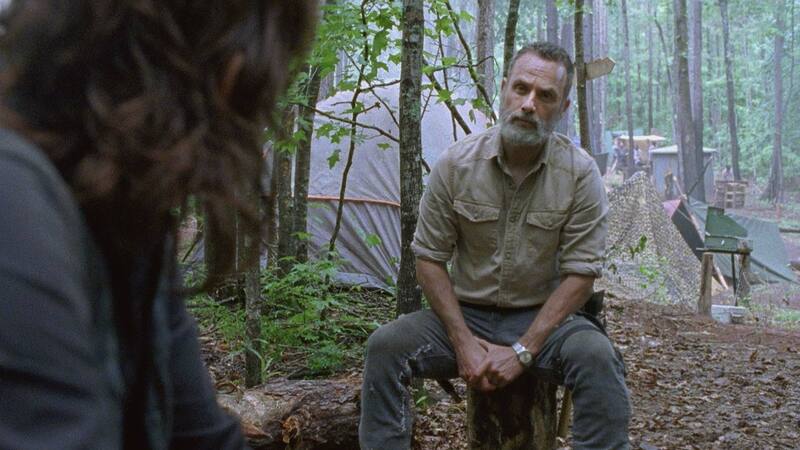 The show is already quite lucrative for AMC in syndication and streaming, and they will at least want to give it a final season. My guess is that the network execs may demand some changes to the later episodes in the current season that have not finished shooting yet. If that doesn’t bring back viewers, the may go into panic mode. The fact is that even though TWD is still pulling good ratings, it has become somewhat of an albatross for the network. The headlines keep emphasizing the ratings declines, and the show is getting beat up pretty regularly by many of the genre sites that cover it (somewhat unfairly if you ask me, especially io9 which has ventured into the realm of TWD cyber-bullying). But again, I don’t believe they would cut the show short with its ninth season. It will get at least a tenth season with the creative team knowing in advance if they should approach that as the possibly show’s last. The fact is that even with the ratings being down, there is no reason for AMC to just cancel the it without giving this long-running show a chance to resolve as many storylines as possible. TWD is already making bank from its encore runs, and even if the current season doesn’t turn a profit (which is possible considering this is an expensive show to produce), the network will make back its money in the long run. So the show will make it through no less than ten seasons, though I’m doubting it will achieve that twelve season mark I previously estimated unless the ratings rebound. What Is the Status of the Franchise? As mentioned above, the AMC boss was previously thinking they would get a decade or more worth of mileage from this franchise, and they definitely will not be giving up on it anytime soon. Fear the Walking Dead is scheduled to be back in 2019 for its fifth season, and I’m expecting it to stick around through at least a sixth year to get it to a syndication friendly count of episodes (though five seasons might have it close enough). If they do decide to wrap up the parent series around its tenth season, they may still try for another spin-off. Or perhaps they will let it rest for a while and then kick off a new show. I’ve heard it mentioned on other sites that an anthology series would be the best way to go and I agree with that. They could bring in known genre writers to do standalone episodes, and they could also have mini-story arcs that cover two or more episodes. The series could also revisit the main show’s cast in either flashback episodes or just by checking in on where they are now. They could do the same with the Fear the Walking Dead characters as well. The format would give plenty of flexibility and could breathe some new life into the franchise. If not that direction, I’m sure that AMC will take some other shots at continuing the franchise. But whatever they do, they need to pay attention to why the fans have grown unhappy with the show and stop looking at this as a juggernaut that will keep going on its past momentum. The zombie rot has officially set in now and could bring down the lead show in a season or two. But there is still potential for the franchise if AMC retools and reconsiders what direction to take it and–mostly importantly–listens to the fans.